From the time we learn to speak we are taught if you don’t have anything nice to say, don’t say it at all. While this old adage is beneficial when it comes to things like blatant insults and mean-spirited criticism, it also has some serious consequences. In one arena in particular, this message has completely derailed our ability to grow and improve, and has reinforced the notion that we should keep our mouths shut even when things aren’t going well. So, in what arena does this mantra take the biggest toll? Giving feedback. Feedback is a critical tool that can help us to level-up in all areas of our lives– both personally and professionally. The problem is that most people don’t know how to give feedback in ways that are digestible and impactful, so we wind up botching the process or worse, we avoid the task altogether. Furthermore, receiving feedback is also a terrifying experience for many of us, and most frequently results in defensiveness or a downward shame spiral. Bottom line: feedback generates fear and discomfort on both sides and we need a better approach to leveraging this critical skill. Initially developed by Kim Scott and Jason Rosoff (both former Google execs) to help bosses deliver meaningful feedback at work without losing their humanity, this simple but powerful feedback framework is relevant to anyone who is dedicated to supporting those around them (co-workers, friends, kids, partners, etc.) in becoming a better version of themselves. The framework is based on a simple premise: we must care personally about the person in front of us AND challenge them directly. By prioritizing these two factors, we are able to deliver feedback that is respectful but also fiercely honest. To help paint a picture, imagine this scenario: you’re in a meeting at work or just about to sit down to a big family dinner. As your high strung co-worker or extremely sensitive son enters the room (whichever scenario is most relevant for you), you notice his fly is down. You freeze. You know you need to give him some feedback to inform him of the oversight, and a multitude of options run through your mind… What do you do? Do you stay silent to avoid embarrassing him? Do you make a joke in front of the whole room? 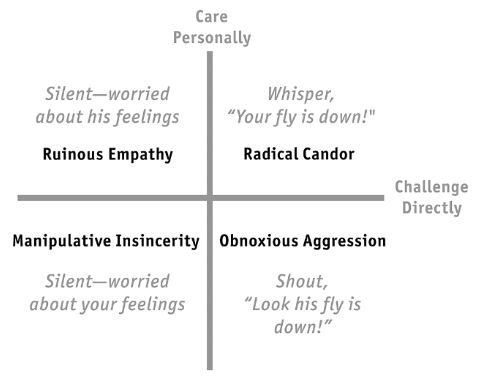 The Radical Candor framework offers a suggestion about how to be direct while still taking care of his well-being. There are several ways to learn more about Radical Candor and become a pro at giving impactful feedback. Like reading? Check out the book! Like listening? Check out the podcast! Like watching? Check out Candor Inc.’s YouTube page! Like browsing? Visit the Radical Candor website!